Ever Thought About Using Facebook® or Instagram® Ads? You've probably seen ads on Facebook® and Instagram® when you're online promoting your business or catching up with friends and family. But, do they really work? And, what are the benefits for your business? Let's explore these questions and explain how you can utilize digital advertising to build your business in 2019. Do Facebook and Instagram Ads Really Work? The answer is "110% Yes" according to Lyfe Marketing®. An online advertising campaign that they ran generated over $103,000 in sales in about eight months using a minimal advertising budget. The caveat: in order to be successful with Facebook and Instagram ads, it's important to fully understand your customer, have clear advertising goals and adapt your campaign using Facebook's Ads Manager and Audience Insights tools. Dan Shewan of WordStream® agrees, indicating that Facebook/Instagram advertising works well because it allows you to "target specific audiences that are likely to be interested in your products and services by leveraging the immense wealth of data that Facebook has about its users." And, this type of digital advertising is affordable: you can develop a targeted campaign on Facebook and Instagram for as little as $10 per day. What are the Benefits of Advertising on Facebook and Instagram? 1. 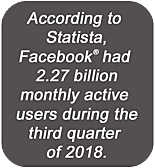 Customers are on Facebook and Instagram: According to Statista®, Facebook had 2.27 billion monthly active users during the third quarter of 2018. And, Instagram reached over 1 billion active monthly users as of June 2018. Wow! That's a lot of potential customers you could reach using Facebook and Instagram ads. Geotargeting: You can specify not only the country, state, city and zip code of the users who will see your ads, but you can also tailor your ads to those within a certain geographic area or mile radius. Interests: What are your customers interested in? Which Facebook pages have they liked? Which Instagram accounts do they follow? Is there affiliated content (i.e., DIY or home improvement topics) that they are interested in? Actions/Behaviors: What devices (i.e., mobile or laptop) do they typically use? What have they purchased in the past? Are they using Facebook and Instagram or just one platform? How many people saw the ad (impressions)? What was the ad's reach? How many likes did the ad get? How many users shared the ad? What was the click-through rate to my website? How many page likes did our Facebook business page get as a result of the ad? 4. Increased Website Traffic: If one of your 2019 business goals is to drive more traffic to your website, Facebook and Instagram ads may be one solution. You could run a website click-ad campaign to Facebook and Instagram users within 40 miles of your brick-and-mortar business to drive customers to your website and let them know there's an HVAC expert in the neighborhood. 5. Facebook and Instagram Ads are Affordable: In his article Top 25 Benefits of Facebook Advertising & Why You Should Be Using Facebook Advertising, Sherman Standberry of Lyfe Marketing says, "Facebook is the most cost-effective advertising investment any business can make....You can double, triple or quadruple your business growth with Facebook advertising." Facebook and Instagram ads are affordable. The added bonus: you have complete control over your budget. 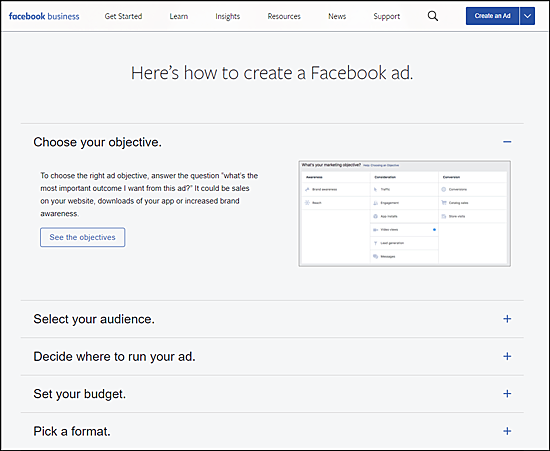 Using the Facebook Ads Manager, you can set your daily budget at $5 or $500, depending on your advertising goals, your audience and your custom ad. You can also decide whether you want your ad to run on Facebook, or Facebook and Instagram to get more bang for your buck. How Can I Get Started with Facebook and Instagram Ads? Check out the Business Ads section of Facebook.com to get started with your Facebook and Instagram ad campaign. There, you will find tutorials on choosing your objective, selecting your audience, running your ads, determining your budget, picking ad formats, measuring ad results and managing your ads. Consider adding digital advertising to your 2019 budget. Facebook and Instagram ads may be an effective and affordable way to reach new customers and stay connected with current clients. Facebook is a registered trademark of Facebook, Inc. Screenshot subject to Facebook copyright. Lyfe Marketing is a trademark of Lyfe Marketing, LLC. WordStream is a registered trademark of WordStream, Inc.
Statista is a registered trademark of Statista, Inc.